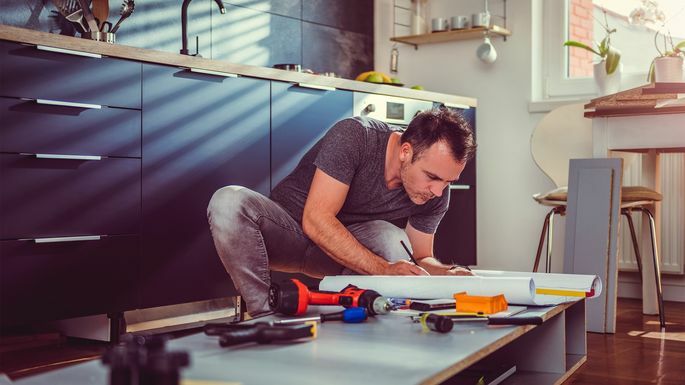 It doesn't matter if you're a first-time home buyer or a decades-long homeowner, fantasizing about a kitchen remodel is just plain fun. Knocking down a wall, adding an island, getting rid of those dated pine cabinets—everyone's makeover master plan is a little different, but the goal is always the same: Get the most you can out of your remodel without overspending. Don't make the mistake of putting the cart before the horse—or in this case, putting the cabinets before the refrigerator. If you're completely remodeling your kitchen, Alexa Battista, a Wayfair home improvement expert, recommends choosing your appliances first, because sizes are limited. “Often, shoppers are excited to get the design underway and will select countertops and cabinets first, but it's much easier to choose countertops and cabinets to fit appliances instead of the other way around,' she says. Cabinets and appliances can make or break your kitchen—literally and figuratively. On one hand, we’ve all seen cheap-looking cabinetry and outdated refrigerators and ovens that practically ruin the look of a kitchen remodel. On the other hand, you can go broke trying to keep up with the Joneses in this area. “Don’t always think that expensive is best,” says Jonathan Faccone, founder of Halo Homebuyers, in Bridgewater, NJ. “You can get beautiful, midgrade cabinets that have the same great look and feel of higher-end cabinets for a reasonable price. “And regardless of cabinet quality, if you don't take care of them, they will not last longer than the less expensive cabinet brand,' he adds. “If you’re unsure about a certain kitchen appliance or product, consult the experts, whether it’s a plumber, contractor, or customer service representative,” she says. Lively warns that a misplaced backsplash is one kitchen remodeling mistake that she often sees. Horizontally, your backsplash should have a clear termination point—either where the walls meet or in alignment with the upper cabinets. And if you think you can get away with an unlevel floor—you probably can’t. “If the kitchen floor isn’t level, the counter won’t be level, unless you know you have an issue and have a strategy to deal with it,” Sassano warns.